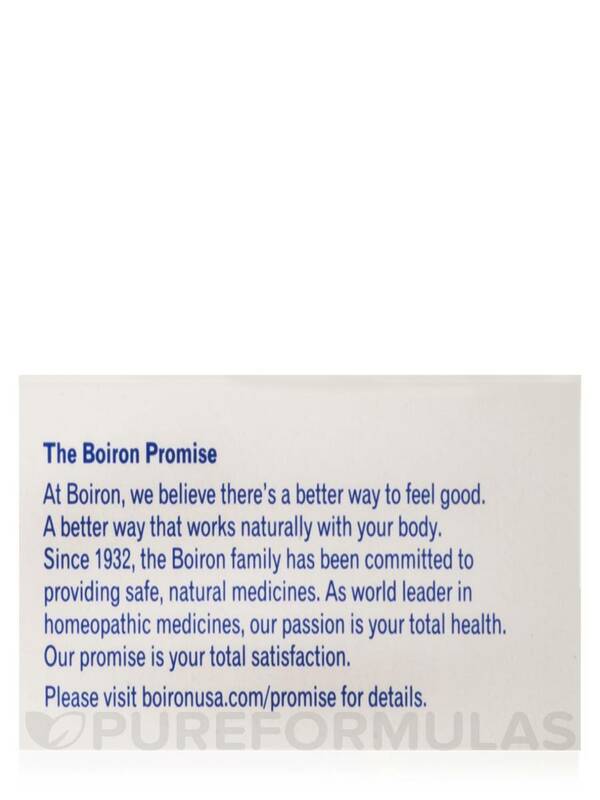 Arnica Montana by Boiron has natural ingredients, works fast and didn't burn. 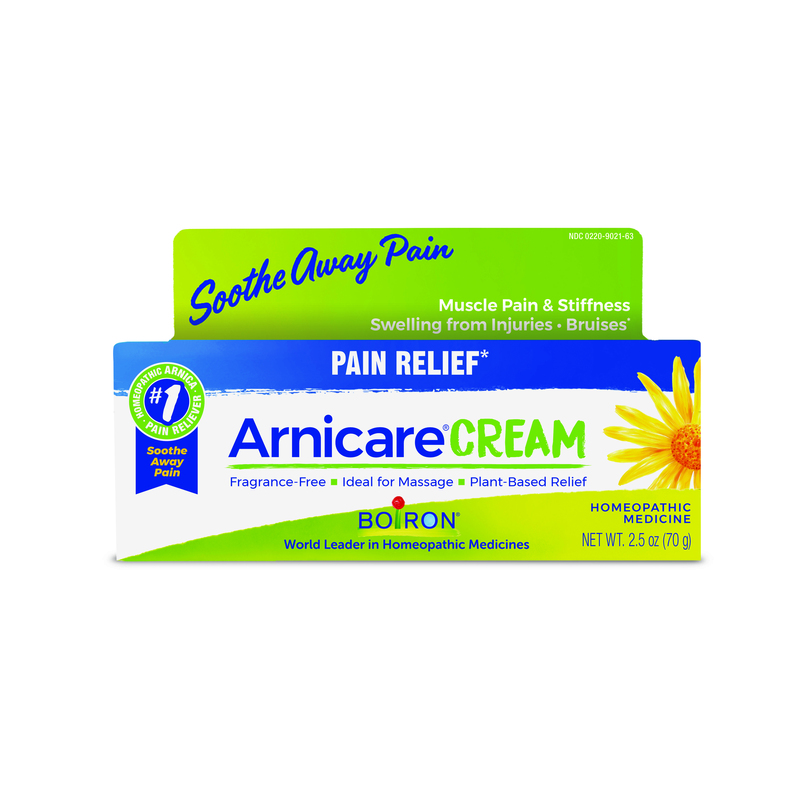 I love Arnicare Cream by Boiron and it is my favorite cream at home.Whatever pain yo might have it will help in no time without any side effects. 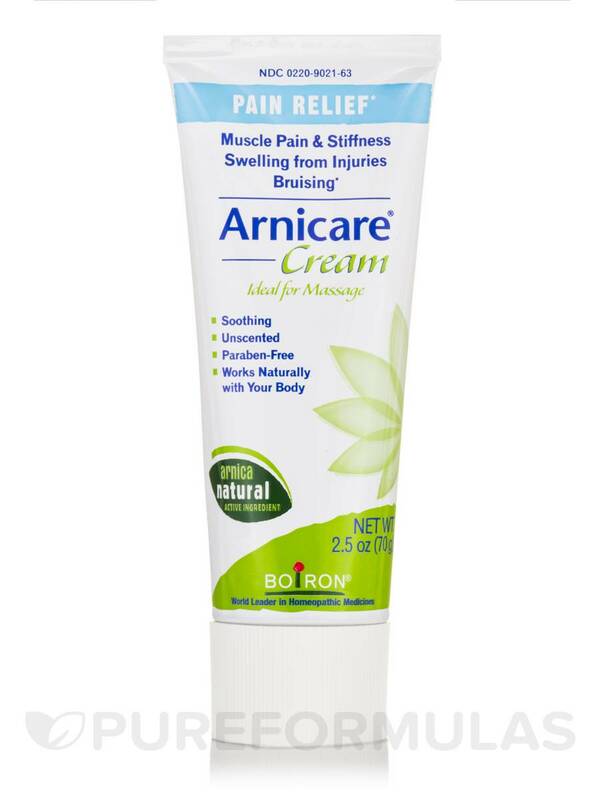 Arnicare Cream by Boiron is a perfect product for everyone who has muscle problems or prone to muscle spasms.It is perfect for massage sessions and provides quick relief.I highly recommend it for everyone. 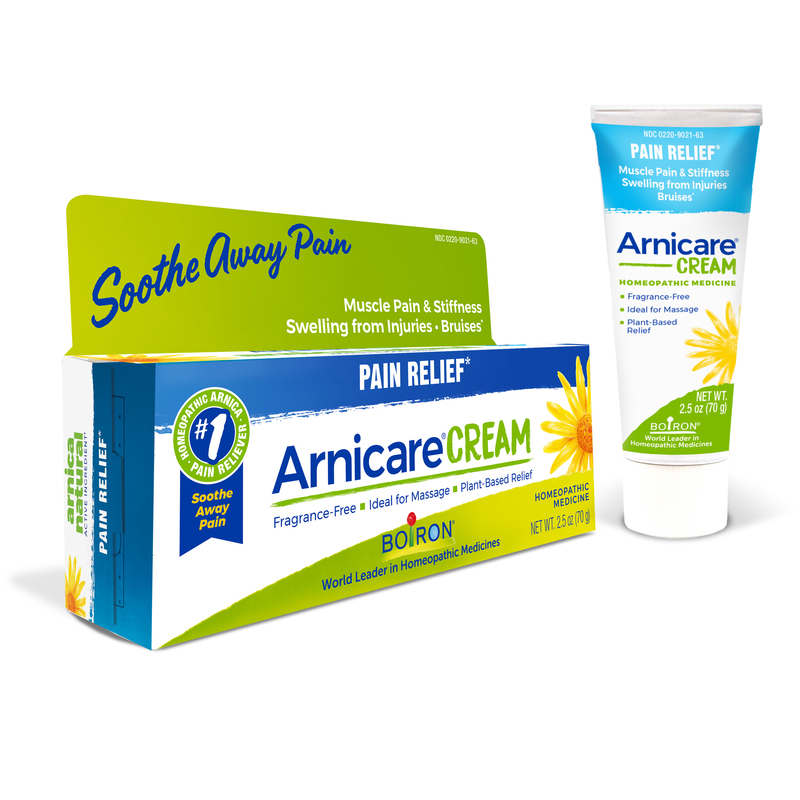 Use Arnicare at the first sign of pain and feel better faster! Temporarily relieves muscle pain and stiffness due to minor injuries‚ overexertion and falls. Reduces pain‚ swelling and discoloration from bruises. - Neck‚ back‚ shoulder‚ leg and foot muscle pain & stiffness. 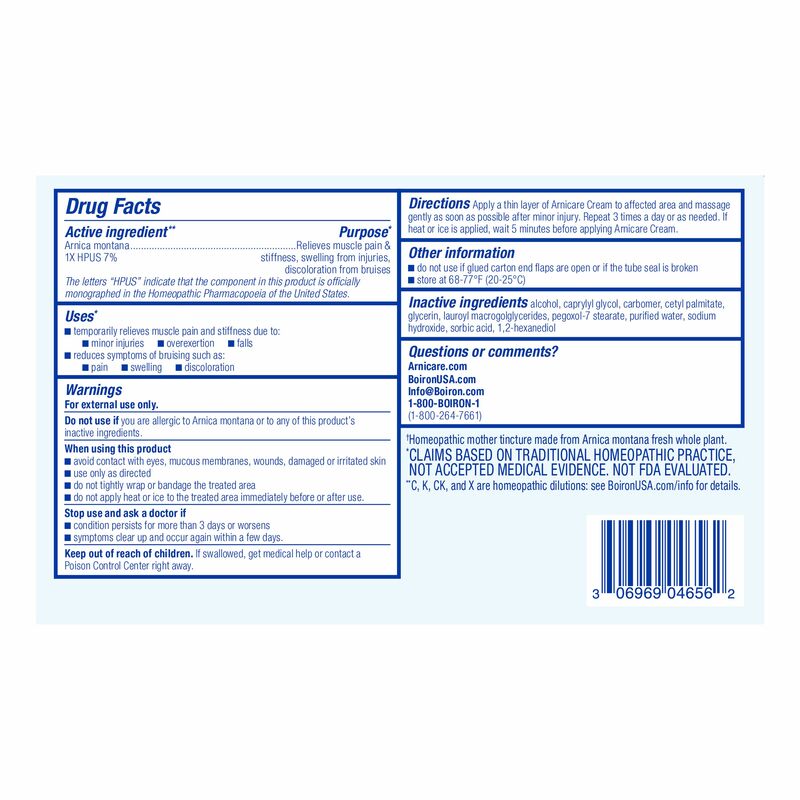 Inactive Ingredients: Alcohol‚ caprylyl glycol‚ carbomer‚ cetyl palmitate‚ EDTA disodium‚ glycerin‚ lauroyl macrogoglycerides‚ pegoxol-7 stearate‚ purified water‚ sodium hydroxide‚ sorbic acid‚ 1‚2-hexanediol. 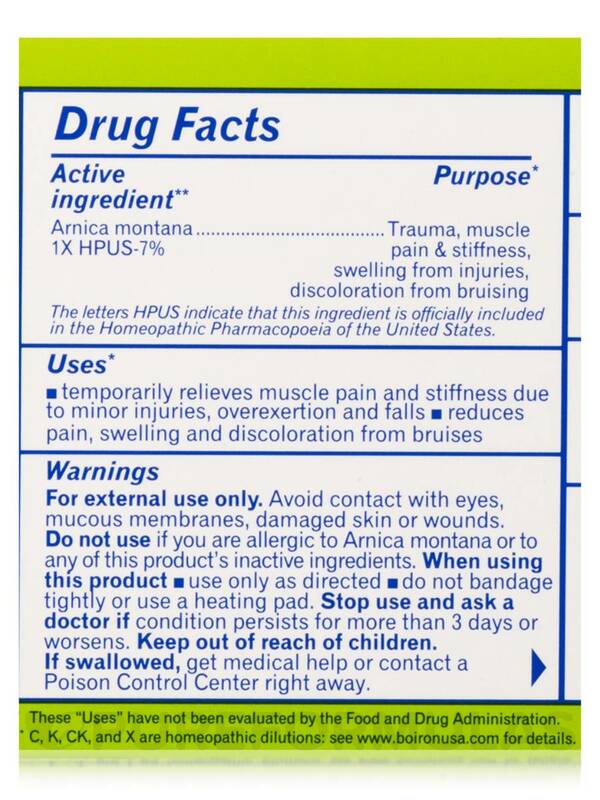 The letters HPUS indicate that this ingredient in officially included in the Homeopathic Pharmacopoeia of the United States. For external use only. Avoid contact with eyes‚ mucous membranes‚ damaged skin or wounds. Do not use if you are allergic to Arnica montana or to any of this product's inactive ingredients. When using this product use only as directed. Do not bandage tightly or use a heating pad. Stop use and ask a doctor if condition persists for more than 3 days or worsens. Keep out of reach of children. If swallowed‚ get medical help or contact a Poison Control Center right away. 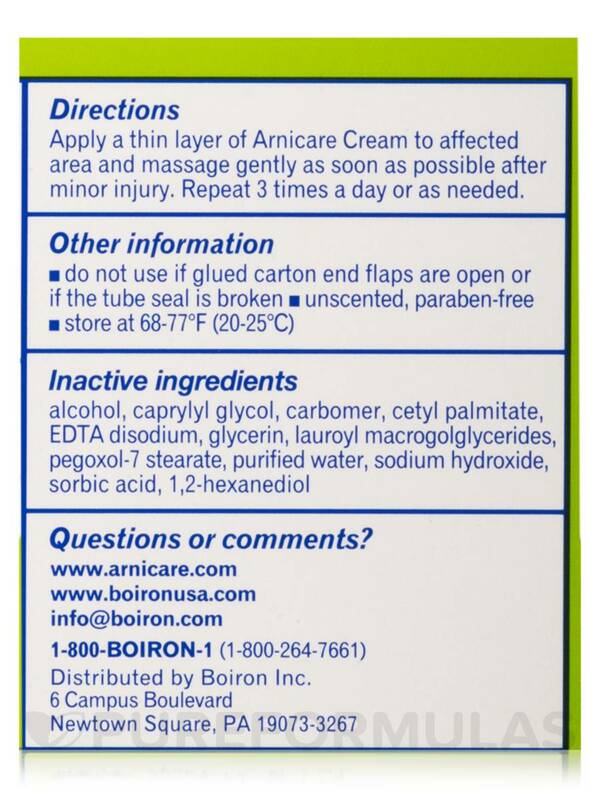 Do not use if glued carton end flaps are open or if the tube seal is broken. Store at 68-77°F (20-25°C). 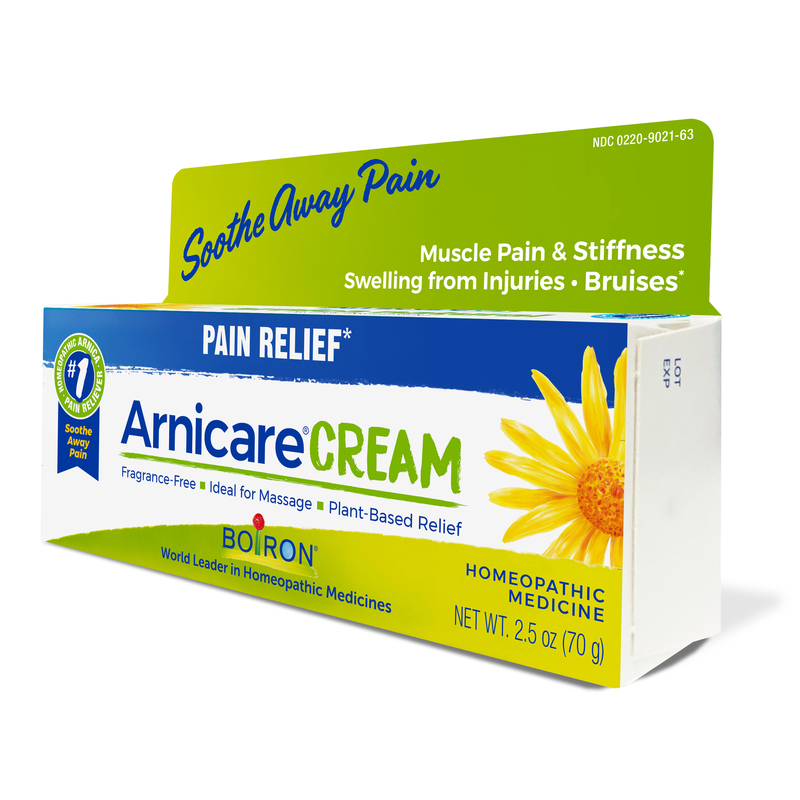 I originally bought Arnicare Cream (Pain Relief) by Boiron to help fade black and blue bruises. Great job! Since then I realize it is good for inflammation also. So I mix it with a drop or two of frankincense essential oil (also good for inflammation)and rub on the sore areas. Great relief with a scent that I like, not a medicinal odor. A little goes a long way. Cream is applied easily, absorbed quickly and is not sticky or greasy. I am always searching for a natural remedies versus medication to help with my fibromyalgia pain and my nerve pain. 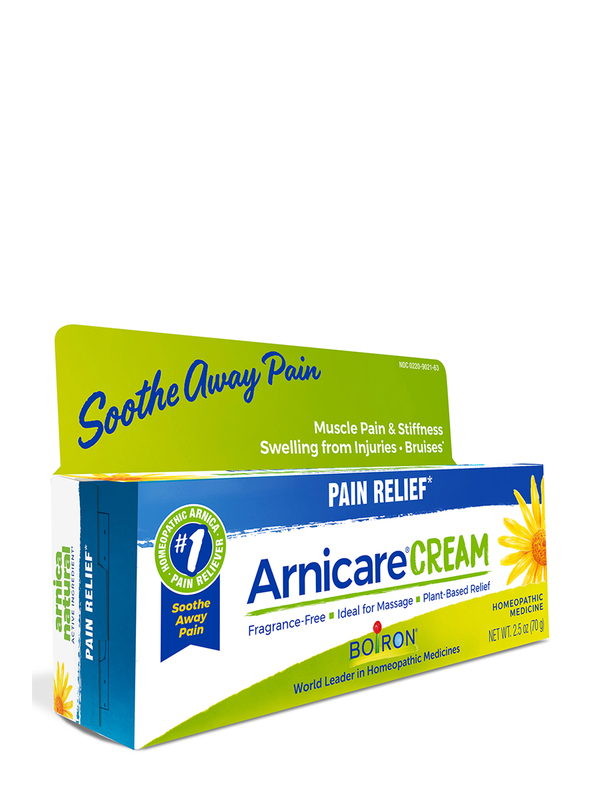 I had a knee replacement and Arnicare Cream by Boiron works great for the pain. It works great for bruises as well. It works quickly and has staying power. There is no odor. Wish they made it in a larger size. The gel is made in a 4.6 oz size but I have not been able to find the cream in a larger size.